Volkswagen recommends having the towing bracket retrofitted by a qualified workshop. The cooling system may need to be modified or heat shields may need to be fitted. Volkswagen recommends using a Volkswagen dealership for this purpose. The dimensions must be adhered to for the retro-fitting of a towing bracket. Always observe the minimum distance given from the middle of the ball coupling to the surface of the road. This also applies when the vehicle is fully laden, including maximum drawbar load. Electrical accessories that are not connected properly can cause faults in the entire vehicle electronics system and also cause accidents and serious injuries. Never connect the trailer's electrical system directly to the electrical connections of the tail lights or to other unsuitable sources of electricity. Only a suitable connector may be used to connect the trailer. A towing bracket should be retrofitted to the vehicle by a qualified workshop. The trailer can become detached from the towing vehicle if the towing bracket is unsuitable or incorrectly fitted. This can cause serious accidents and fatal injuries. 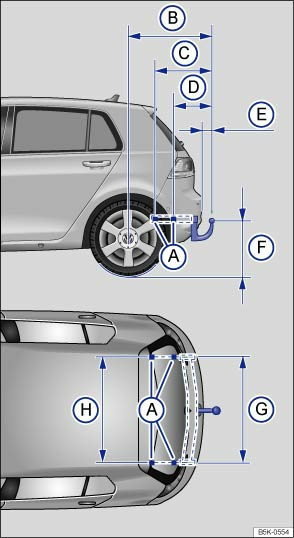 Only use towing brackets which have been approved by Volkswagen for your vehicle type.